This weekend, it is well worth the effort to have a look at Jupiter. The great red spot, the red eye of Jupiter, will be a perfect object to observe. Side note: The Moon is in its waning phase in the last quarter before a new Moon, making it less of a disturbance to observation. The evening hours will soon be there for us to enjoy in all the glorious darkness! Jupiter, the largest of all the planets, has been pulling us along in its orbit for weeks now. The planet will appear with a brightness of -1.8mag and will belong to the brightest objects in the sky. 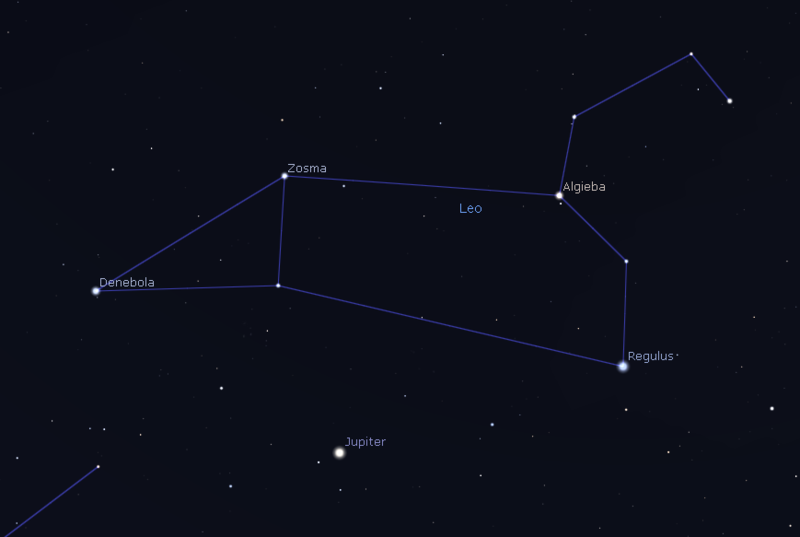 Right as dusk sets in, you will be able to see Jupiter in the south, below Leo. The planet has a diameter of 142,000 km (88,000 miles), as much as 12 Earths in a row, making it a real giant! Were we to book a vacation to Jupiter, we would need about 5 years to reach our destination (444 years with a car). An object 740 million km (460 million miles) away is certainly difficult to reach. With about a 44 arc second diameter, Jupiter provides a lot of detail, including the four Galilean moons, numerous cloud bands, and of course the great red spot – a feature of Jupiter that has long held a secret. Red Eye, What Are You? Back in the year 1663, Robert Hook discovered the spot with his telescope. He saw some movement in the planet and assumed that Jupiter was rotating. The astronomer Giovanni Cassini confirmed Hook’s thoughts. It was only later that researchers discovered that the great red spot was indeed a massive storm on the planet. In all likelihood it has been racing around the planet for centuries! Sometimes shortened to GRS, the great red spot is hard to miss just below the planet’s equator. It’s estimated that winds up to 400 kmh (250 mph) whip the inner areas of the storm. In the year 1980, the spot stretched to 21,000 km (13,000 miles) or roughly two Earths side by side. In recent years however, the spot has shrunk considerably. By the year 2014, the great red spot had mysteriously shriveled to only 16,000 km (10,000 miles) across. Despite it’s smaller size, the GRS and its longevity continues to puzzle researchers. Some have assumed that the spot gobbles up smaller storms, strengthening itself. How Jupiter’s entire atmosphere works in detail also remains a mystery. This weekend presents a great opportunity to check out the great red spot. From Saturday night into the early morning hours of Sunday, the GRS will be easy to spot. A magnification of 100 to 150 will be necessary, however. If the air is still enough, try increasing the magnification just a bit as well. Do you observe with a color filter? A green filter or blue filter W81A will provide ample contrast and improves the visibility of details on the planet. Shadowdance: From Sunday to Monday the moon Io will obscure Jupiter and its shadow on the big planet will provide some interesting perspective. Tip: If you check out Jupiter with your Universe2go, you will get a digital zoom of the planet along with a ton of info and audio explanations!